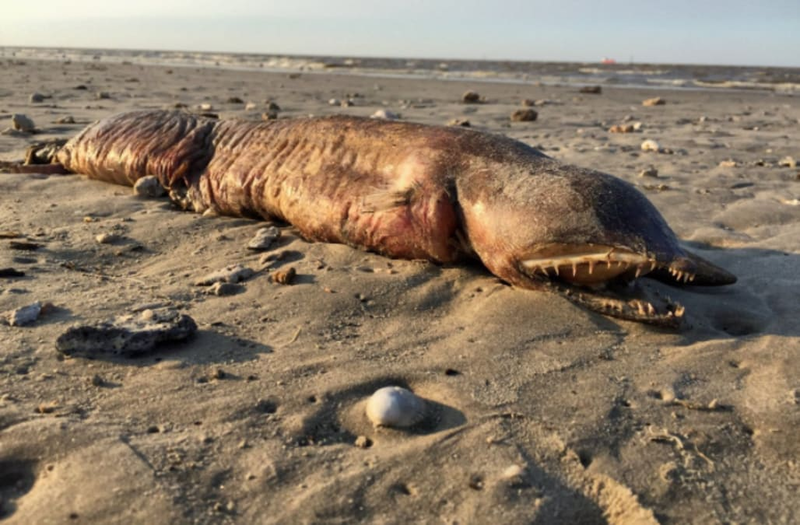 A mysterious fanged sea creature that washed up on a beach in Texas following Hurricane Harvey quickly went viral after images emerged on Twitter. Preeti Desai came across the creature while walking along Texas City beach and posted images on Twitter to ask for help identifying it. "Okay, biology twitter, what the heck is this?? Found on a beach in Texas City, TX," Desai wrote on September 6. Her request eventually found its way to biologist and eel specialist Dr. Kenneth Tighe, who told BBC there was a high probability the seemingly unidentifiable animal was either a fangtooth eel, a garden eel or a conger eel. "All three of these species occur off Texas and have large fang-like teeth," he told the outlet. The fangtooth eel is usually found in the western Atlantic Ocean in waters between 30 and 90 meters deep. Whatever the animal, Twitter users seemed to agree on one thing: this strange sea creature is the stuff of nightmares. As if watching Jaws as a kid wasn't enough, another reason not to go in the water :).